It was a fun ride while it lasted, here is my report on the final awesome convention that is Con-G. I could unfortunately only attend for a single day this year, a single day which I enjoyed very much. in fact. I was on a skiing trip till late Friday night, then had to pick-up my gear Sat morning, I arrived at the convention around 2pm, really wish I could have made it earlier as there was lots to do. I ran into several people I know, cosplayers and photographers alike, also met the lovely staff of Con-G who were hard at work running the convention. They were once again kind enought to provide me with a media badge as official con photographer! So I once again did my best to cover the exciting events at Con-G like the Godzilla cardboard Tokyo smash, the Rave Dance and other fun stuff! The artist alley and dealer's room are relatively small compared to bigger cons, but they had the staples you'd look for, I ended up buying a few pins and other small items in the AA. The Daleks did not take up the front lobby area this year so there was more room for people to move around in, it was the game area if I recall correctly! And also the line get Scott McNeil's autograph, what an awesome guy. I sadly didn't get the chance to meet Dante Basco (who played Rufio in the Peter Pan movie), maybe I'll meet at another con though. I was also asked to be the masquerade green room photographer which I happily obliged! So everyone got to come see me in my beautiful corner of the green room to have their photo taken so that the judges would have reference photos. Must say I enjoyed it! I attended Kudrel's panel on "Social Media Effect on Cosplay" which was particularly interesting with all the recent drama that's been happening on the net. It was an interesting talk back and forth between the 8/9 of us that were there, important lengthy points that I will not bring up here. I'm going to try and stay away from the whole thing but can't help but feel it may come to affect me at some point? Regardless, I'll just continue to do what I enjoy. As you know, this was the last year for Con-G. After 6 successfull years they simply could not take anymore more love from their fans (and the growing number of people that were attending). I don't know what the official attendance number are but I heard somewhere around 1,300 which is quite large when you think back to the first year of around 350! Milestones have been reached, the double-edged sword kind. 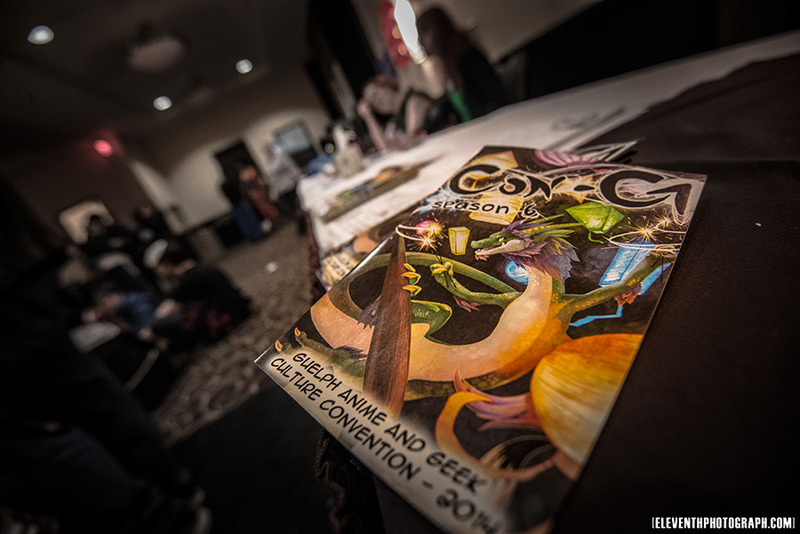 Speaking of first year of Con-G, in the main gallery for this year, you'll find some additional photos that date back to the first and second year of Con-G; they were held in the venue/hotel across the street from this year's venue! You'll have to excuse the poor photo quality, they were taken on my then-current cellphone camera. Oh how times have changed. P.S Maybe one day someone will start a convention in my hometown of Woodstock and call it Con-W... rolls right off the tongue!